How do all these words tie together? And do they have anything to do with our sense of belonging? These are deep concepts that are hard to handle in a simple blog. By a simple person. But because my post from last week (Does That Shame Really Belong in Your Baggage) touched on these topics, I don’t want to walk away from them. I hinted in that post that some shame is misplaced while other shame is well-placed. What’s the difference? Shame can be defined as a negative, painful emotion that is the result of having done something wrong or foolish and can be brought about by being caught in the act of doing something immoral or illegal. Shame is a common emotion that destroys self-esteem and makes a person feel unworthy. So that answers one of my questions: Yes, shame has everything to do with belonging because it makes us feel unworthy. So the story referenced in my previous post should have brought no shame on me. I wasn’t at fault. I didn’t dishonor God. The bully in the story was at fault. He did dishonor God when he humiliated me. Sadly I carried that misplaced shame myself way too long. And to be honest, remnants still remain in my baggage to this day. Silly, teasing words that continue to haunt. Misplaced shame does not dishonor God — and though it is something that may paralyze us, it is not something that we did wrong. We need to recognize it, and deal with it, so that we can move forward and be emotionally healthy, but we do not need to ask forgiveness for something we did wrong. Well-placed shame does dishonor God. We should be ashamed of our actions or words. We did do something wrong. The shame is deserved. It does cause us to withdraw from others and feel undeserving. What do we do with that? Are we just condemned? Lost? Forever on the outside looking in? This is where shame and grace and mercy collide. God, in his mercy, offers us grace and forgiveness when we bring our shame to Him. Do you carry well-placed shame? Is it keeping you from others? Do you hide? Withdraw? Feel like you don’t… can’t belong? No words I could say to you will bring the comfort God’s Word has to offer. I won’t even try — He says it best. I am going to put some of His words right here so that they can wash over you. I hope those verses offer hope and healing to you. God is waiting to forgive us, and take away our shame. We don’t have to hide from him — or others. We can boldly and confidently seek out our place and our people. And the good news? Once we accept his grace, we belong to him. And isn’t that just the best place to belong! This is powerful, Connie. Thank you for digging deep and pointing us to truth. More of us carry misplaced shame than we’d like to admit. Great post! Do you think my husband will notice I've stolen a corner of the back porch for a studio space? 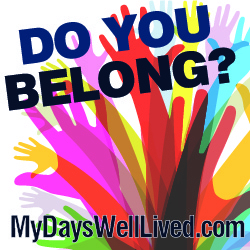 I challenged myself and wrote for 31 consecutive days about the topic of Belonging. Find the posts here! 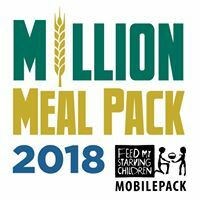 This will be our 9th year to pack for FMSC — and our goal is big — One Million Meals! Art Class at Thurston Woods Retirement Village — Read about the fun we have — and see their artwork here!